Fiber is important for more than just regular bowel movements. Did you know it can also reduce the risk of blood clots, decrease inflammation, and lower cholesterol (a growing problem in kids)? Foods that are considered to be high in fiber contain at least 5 grams per serving. Foods with a good source of fiber have 2.5 to 4 grams per serving. But don’t be fooled by some cereals that add extra fiber they may not actually contain that much whole grain. The whole grain has all the super health compounds. 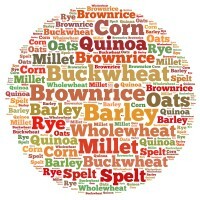 Read the ingredient list and look for the words “whole” such as whole oats, whole wheat, and whole rye. If the package lists “enriched” or “bleached” flour as a primary ingredient, it’s not a source of health-promoting ingredients for your family or child. Eat More Veggies: Experiment with local heirloom carrots, beets, and tomatoes. Add chopped tomato or sliced peppers to soups, bean dishes, and entrees. Make it a goal to pack sliced peppers, baby tomatoes or cucumbers in your child’s lunch for a cool and crispy snack. Eat More Beans: Include lentils –they are also jammed packed with fiber and contain diabetes and heart disease-fighting compounds. Lentil soup is so easy, and kids usually like it. If they don’t warm up to it, try pureeing. Try New Pastas: Try replacing traditional pasta with some whole grain pasta, such as whole wheat pasta or a whole wheat blend pasta, spelt, quinoa spaghetti (pronounced keen-wa), Japanese buckwheat noodles (also known as soba noodles) or whole wheat pasta. Japanese buckwheat noodles are delicious with the occasion lean beef stir-fry with peppers and onions, often a big hit with the meat and potato eaters. Our children will learn to eat – and enjoy – a variety of healthy foods only when they’re encouraged to try these foods and when they see family members enjoying these foods. Cut up an apple for yourself, and offer a slice to your child. Keep a bowl of cut-up veggies in the fridge and make sure you and your kids use it often. Plan a healthy after-school snack, and then sit and enjoy it with your kids. All of these small steps, repeated over and over again as your children grow up, have a huge impact. We were at a vacation resort this past week, and my college-age boys routinely chose salads and fresh fruit from the buffet line at meals – without any urging from me! Setting a healthy example really works! 10 Ways to Enjoy Ancient Grains and Seeds!